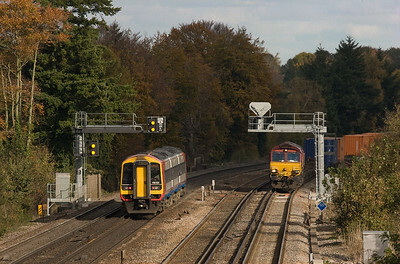 Guildford in Surrey southwest of London netted a few hours of railfanning, mostly in sunshine to boot. 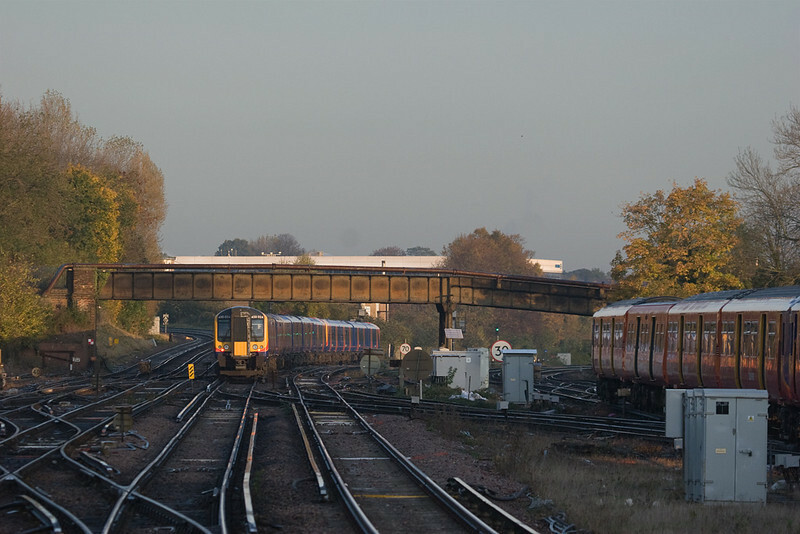 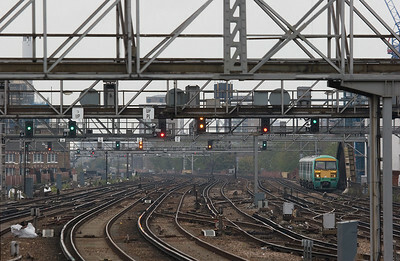 A few bonus shots from Clapham Junction and other London-area stations are included. 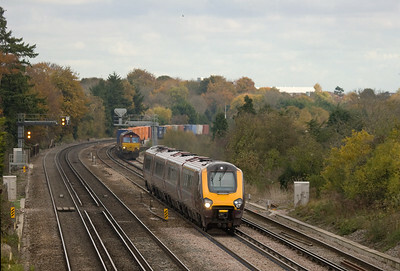 Freightliner 66536 with the 4M50 07:25 Southampton-Crewe approaching Basingstoke. 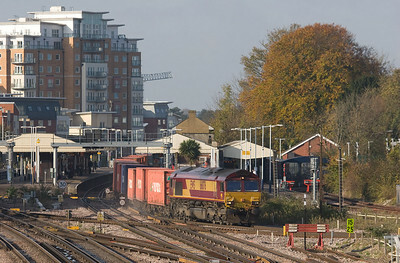 EWS 66076 with the 4M33 08:10 Southampton - Burton on Trent intermodal in Basingstoke, turning towards Reading. 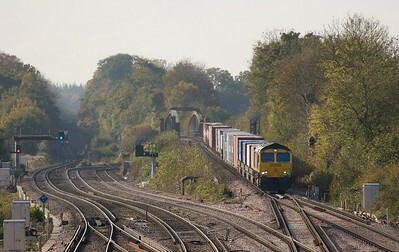 Freightliner 66579 with the 4O14 05:28 Garston - Southampton approaching Worting Junction. 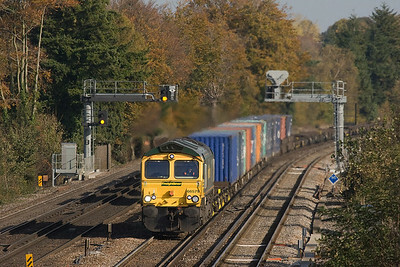 Freightliner 66574 with the 4M58 11:00 Southampton - Ditton in Worting Junction. 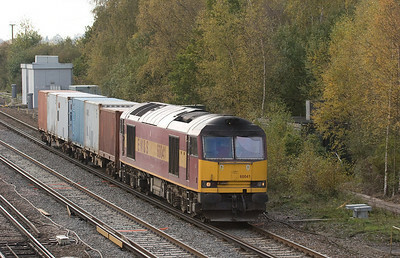 159 103 passes EWS 66067 with the 4O04 9:35 Washwood Heath - Eastleigh Yard intermodal stopped at Worting Junction. 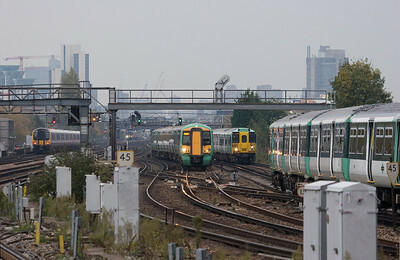 Crosscountry DMU Manchester Picadilly - Portsmouth overtakes EWS 66067 with the 4O04 9:35 Washwood Heath - Eastleigh Yard intermodal in Worting Junction. 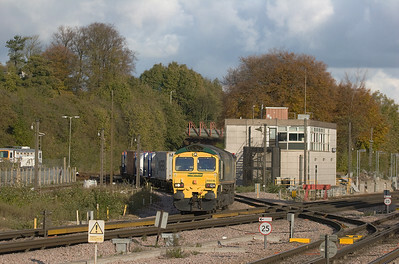 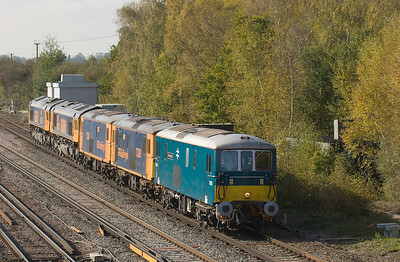 EWS 60041 with the 6V38 11:39 Marchwood - Didcot Yard MoD stores in Worting Junction. 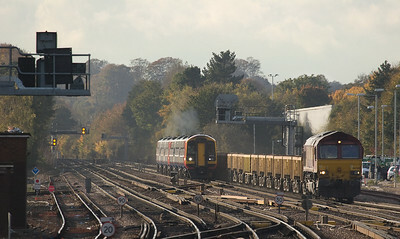 159 107 and EWS 66200 with the 6V27 13:50 Eastleigh Yard - Hinksey VQ departmental approaching Basingstoke. 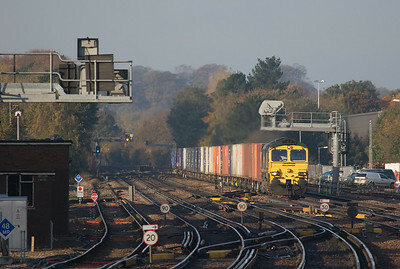 Freightliner 66516 with the 4O27 07:12 Ditton - Southampton in Basingstoke. 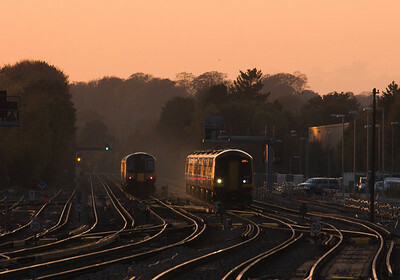 159 inbound passes 450 outbound in Basingstoke at sunset. 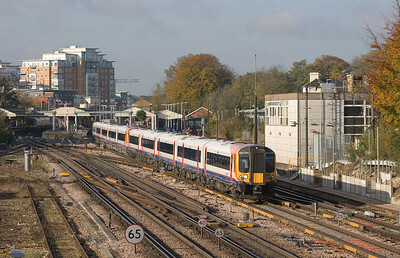 Southern und Southwest Trains EMUs in Clapham Junction. 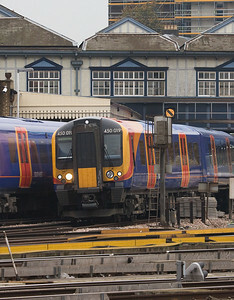 If you like EMUs, Clapham is the place to be! 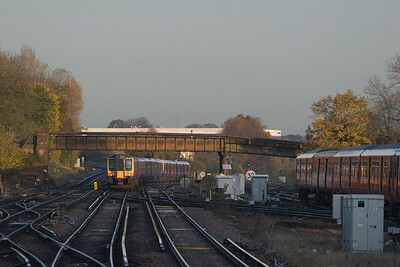 London Overground 313116 in Clapham Junction. 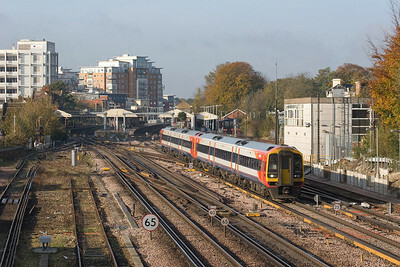 Train time at Clapham Junction. 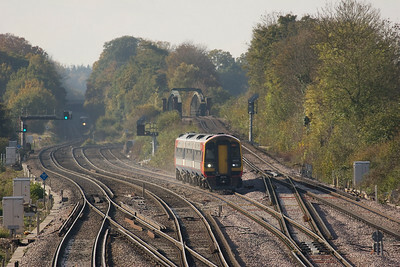 Even though I visited on a Saturday there was still plenty of traffic with a good variety of equipment. 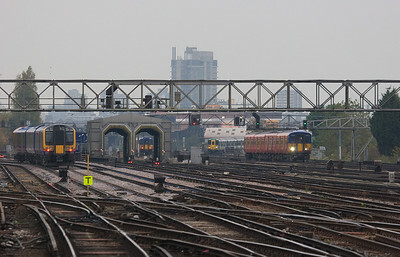 450 019 races through Clapham Junction on its way to Waterloo station. 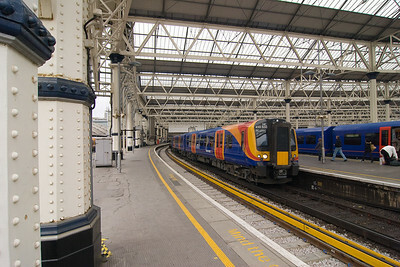 450 550 HC inside the grand curved trainshed of Waterloo station. 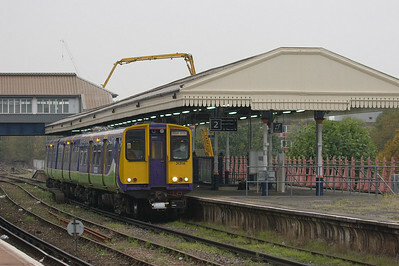 Southern EMU approaching London Bridge station. 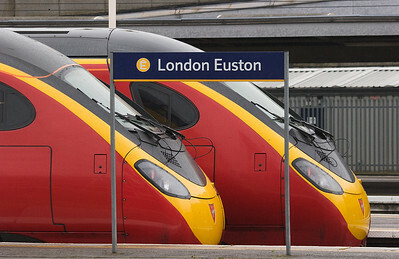 Virgin Express Pendolinos in London Euston station.